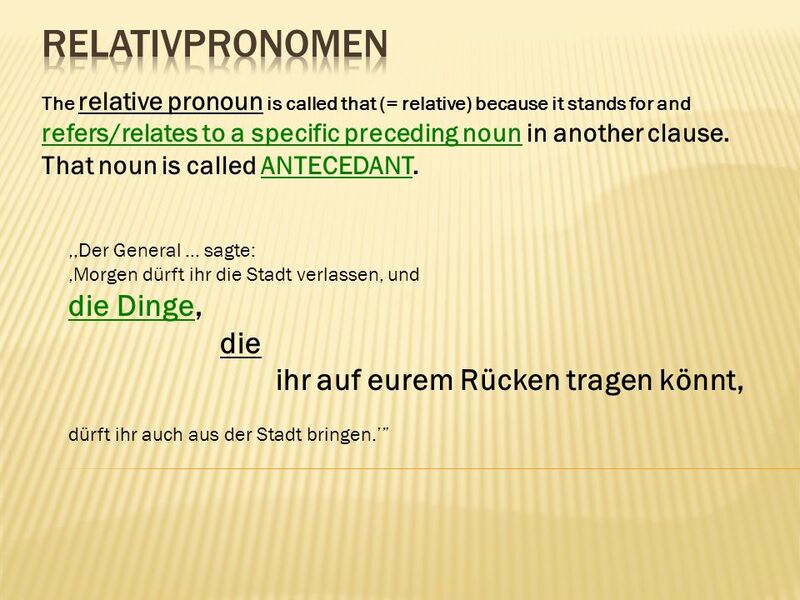 ,,Der General … sagte: ,Morgen dürft ihr die Stadt verlassen, und die Dinge, die ihr auf eurem Rücken tragen könnt, dürft ihr auch aus der Stadt bringen.’” (Aus: ,,Die Weiber von Weinsberg”) English equivalent: … the things that/which you can carry on your back …. 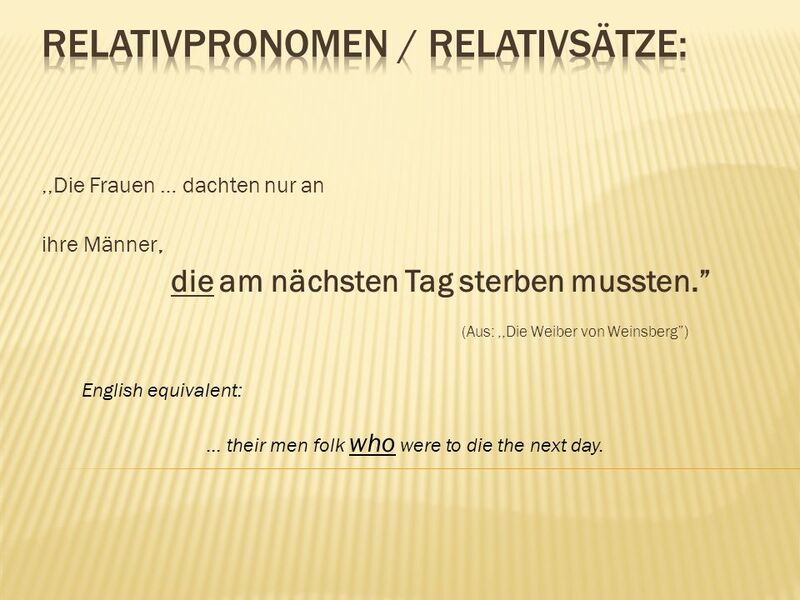 ,,Die Frauen … dachten nur an ihre Männer, die am nächsten Tag sterben mussten.” (Aus: ,,Die Weiber von Weinsberg”) English equivalent: … their men folk who were to die the next day. 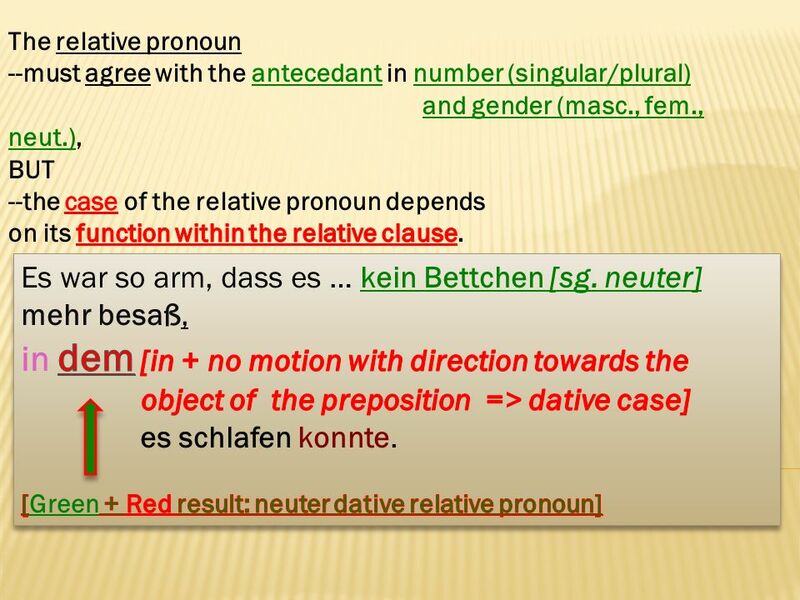 The relative pronoun is called that (= relative) because it stands for and refers/relates to a specific preceding noun in another clause. 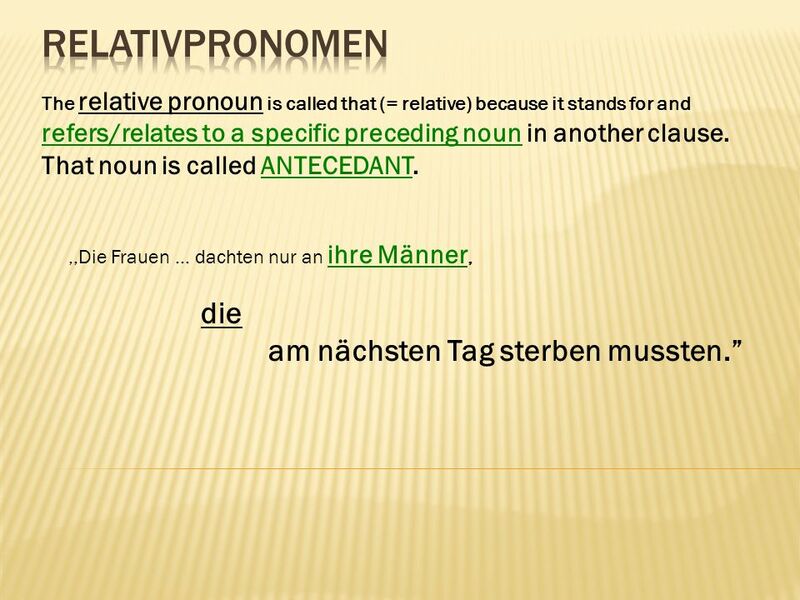 That noun is called ANTECEDANT. 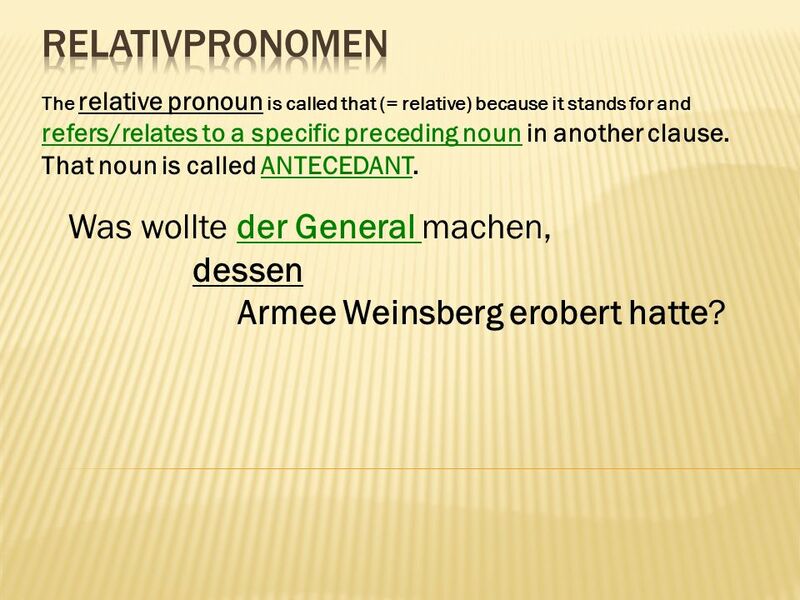 Was wollte der General machen, dessen Armee Weinsberg erobert hatte? maskulin Sg. neutrum Sg. feminin Sg. 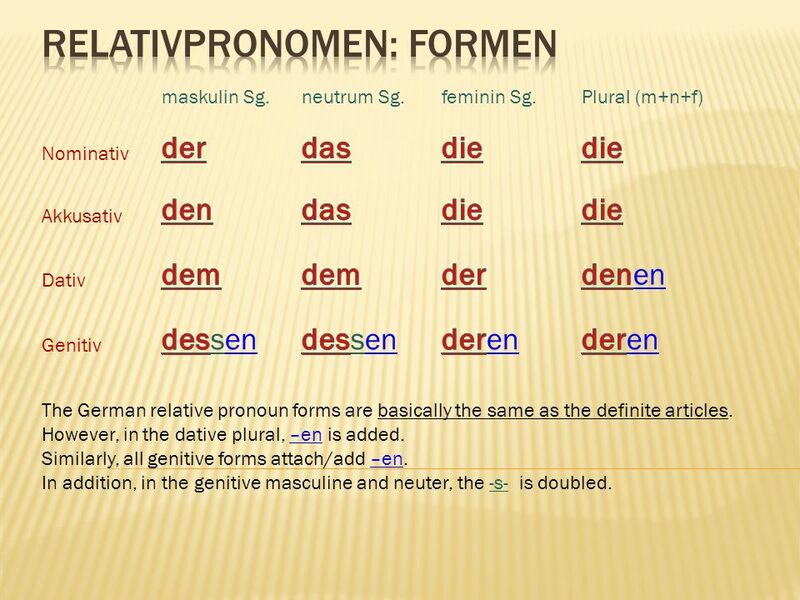 Plural (m+n+f) der das die die Nominativ den das die die Akkusativ dem dem der denen Dativ dessen dessen deren deren Genitiv The German relative pronoun forms are basically the same as the definite articles. 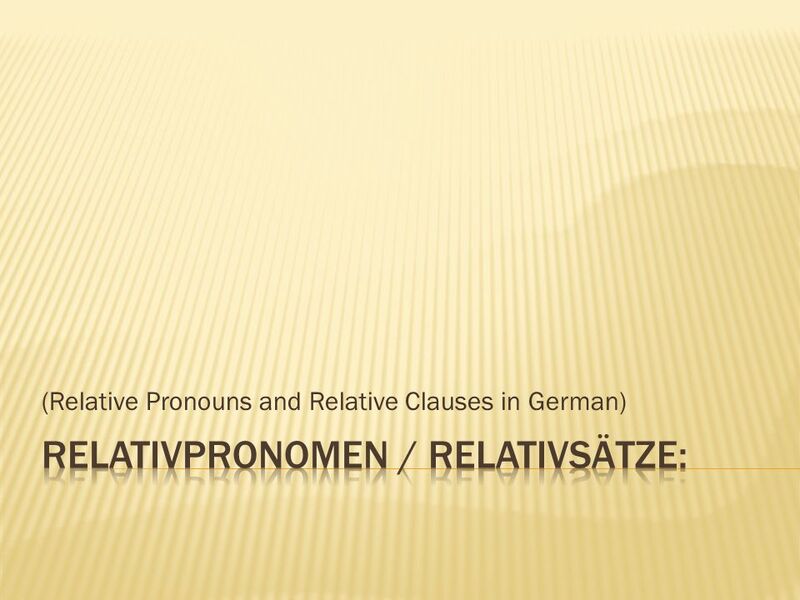 However, in the dative plural, –en is added. 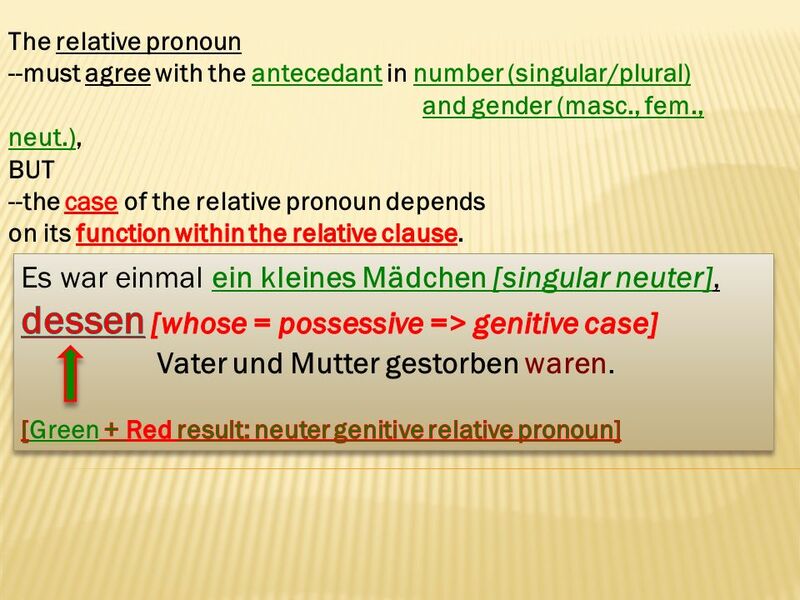 Similarly, all genitive forms attach/add –en. 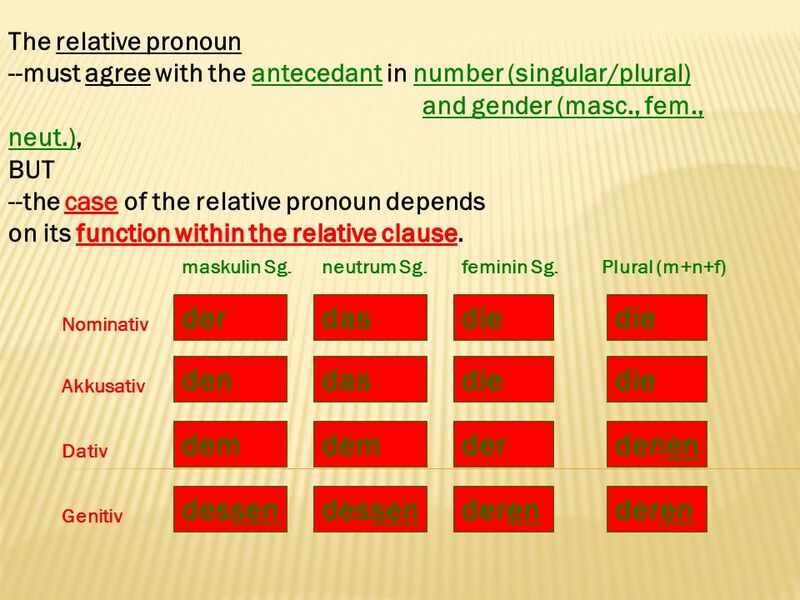 In addition, in the genitive masculine and neuter, the -s- is doubled. 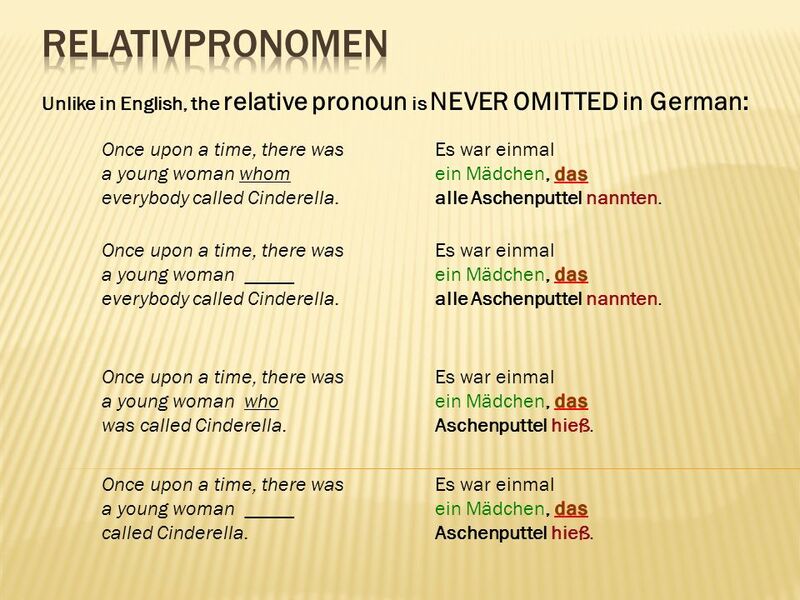 9 Relativpronomen Unlike in English, the relative pronoun is NEVER OMITTED in German: Once upon a time, there was a young woman whom everybody called Cinderella. Es war einmal ein Mädchen, das alle Aschenputtel nannten. Once upon a time, there was a young woman _____ everybody called Cinderella. Es war einmal ein Mädchen, das alle Aschenputtel nannten. Once upon a time, there was a young woman who was called Cinderella. Es war einmal ein Mädchen, das Aschenputtel hieß. Once upon a time, there was a young woman _____ called Cinderella. Es war einmal ein Mädchen, das Aschenputtel hieß. 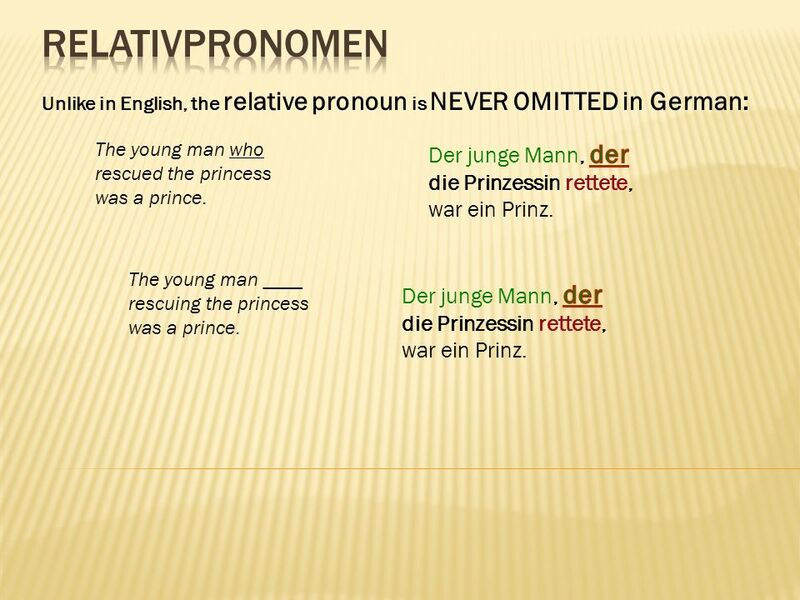 Unlike in English, the relative pronoun is NEVER OMITTED in German: The young man who rescued the princess was a prince. Der junge Mann, der die Prinzessin rettete, war ein Prinz. The young man ____ rescuing the princess was a prince. Der junge Mann, der die Prinzessin rettete, war ein Prinz. 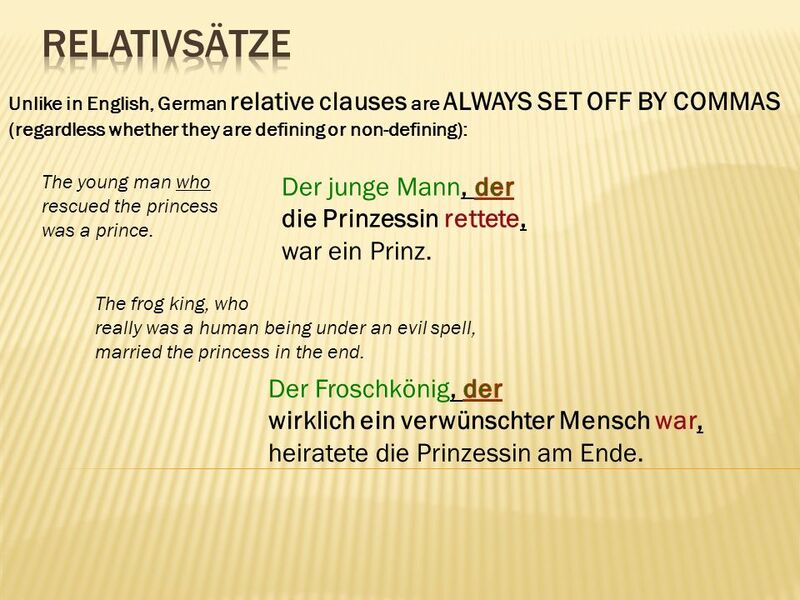 Unlike in English, German relative clauses are ALWAYS SET OFF BY COMMAS (regardless whether they are defining or non-defining): The young man who rescued the princess was a prince. Der junge Mann, der die Prinzessin rettete, war ein Prinz. The frog king, who really was a human being under an evil spell, married the princess in the end. Der Froschkönig, der wirklich ein verwünschter Mensch war, heiratete die Prinzessin am Ende. 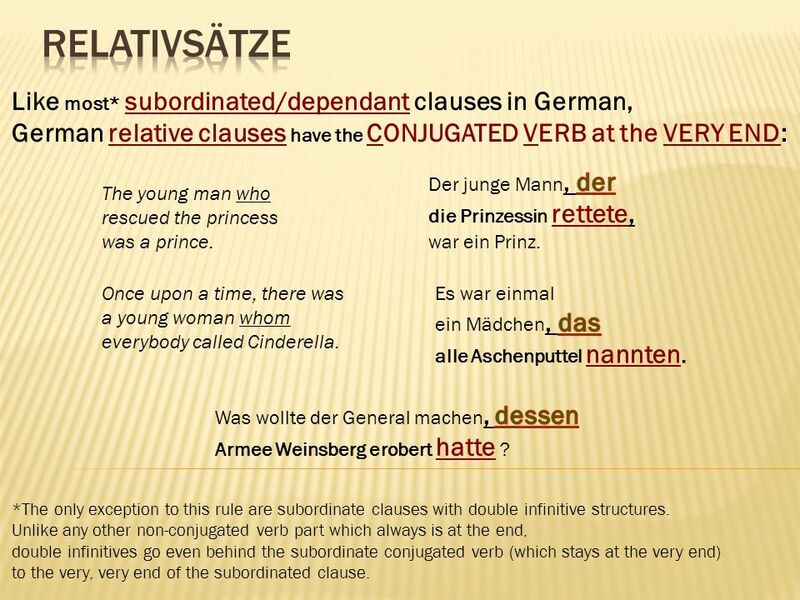 German relative clauses have the CONJUGATED VERB at the VERY END: Der junge Mann, der die Prinzessin rettete, war ein Prinz. The young man who rescued the princess was a prince. Once upon a time, there was a young woman whom everybody called Cinderella. Es war einmal ein Mädchen, das alle Aschenputtel nannten. 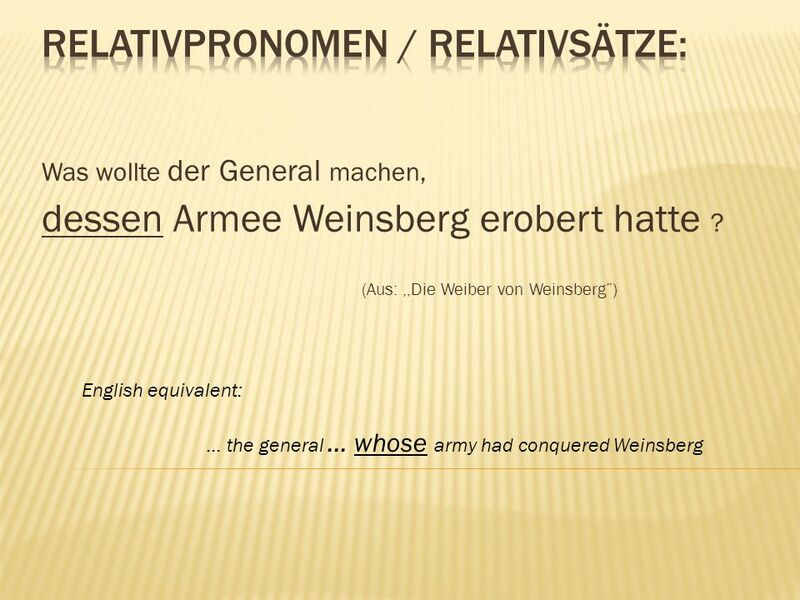 Was wollte der General machen, dessen Armee Weinsberg erobert hatte ? 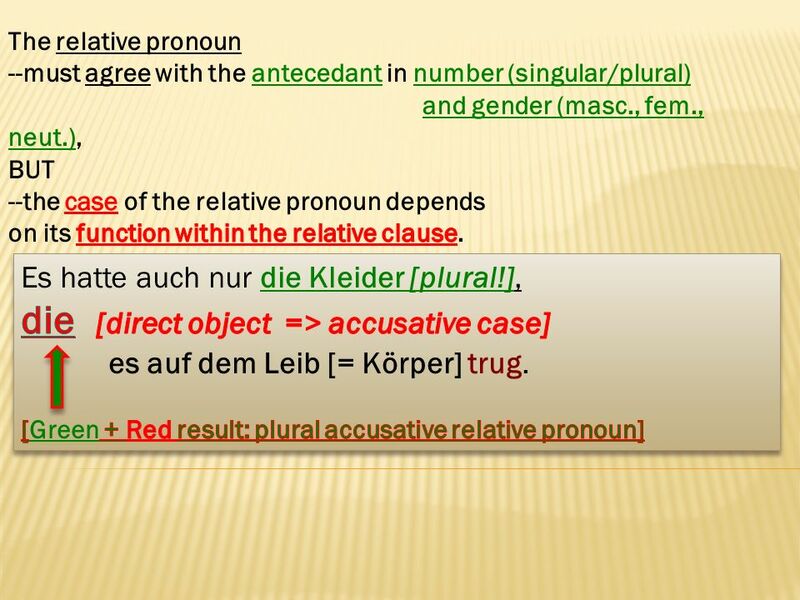 *The only exception to this rule are subordinate clauses with double infinitive structures. 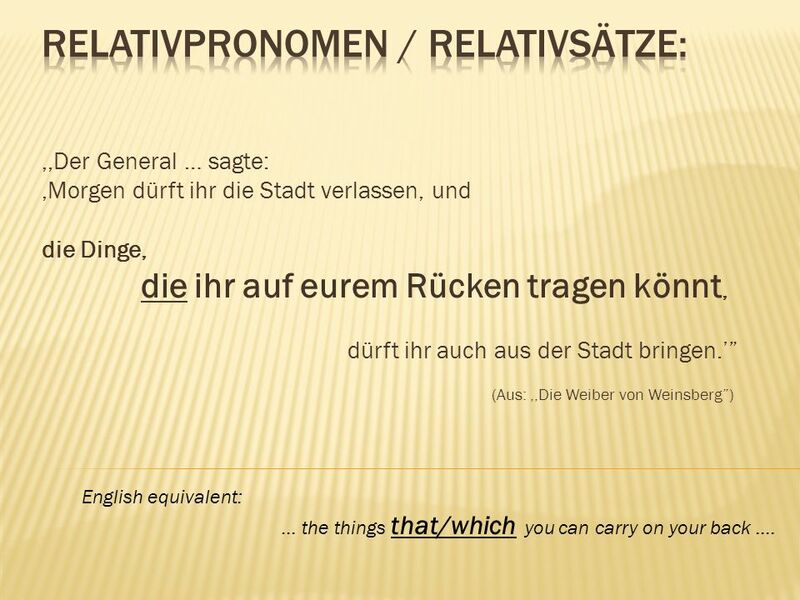 Unlike any other non-conjugated verb part which always is at the end, double infinitives go even behind the subordinate conjugated verb (which stays at the very end) to the very, very end of the subordinated clause. Unlike in English, if there is a PREPOSITION connected to the relative pronoun, it ALWAYS PRECEDES (= goes before) the relative pronoun: Das Tier, mit dem Rotkäppchen sprach, war ein großer, böser Wolf. 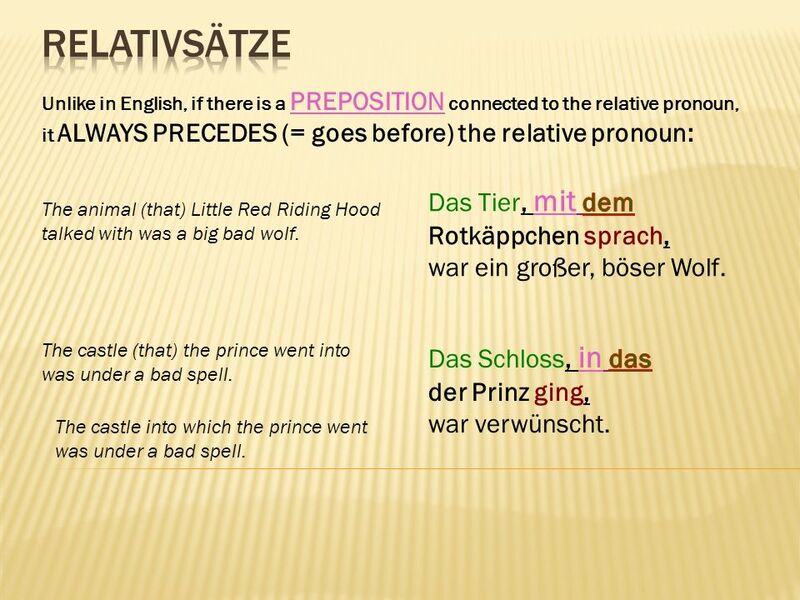 The animal (that) Little Red Riding Hood talked with was a big bad wolf. The castle (that) the prince went into was under a bad spell. Das Schloss, in das der Prinz ging, war verwünscht. The castle into which the prince went was under a bad spell. 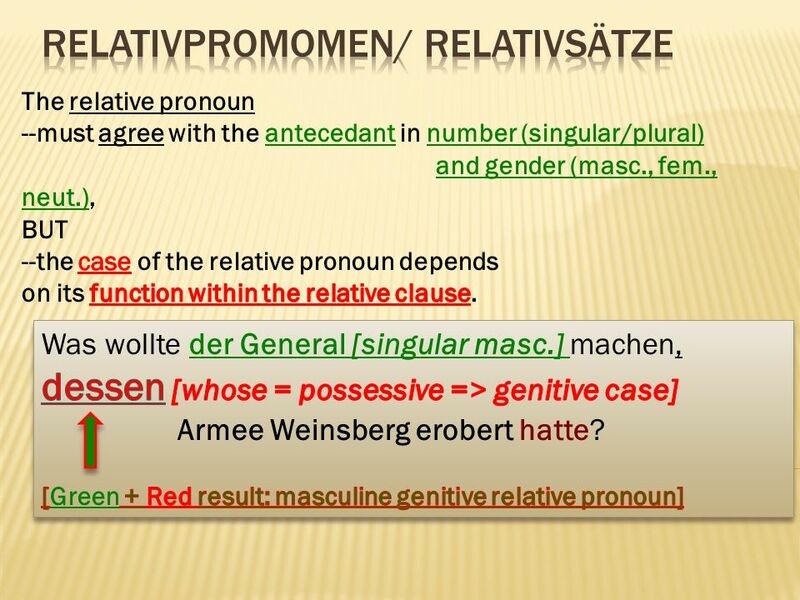 Herunterladen ppt "Relativpronomen / Relativsätze:"